Developer Quote: "The Cars iManager application allows you to store everything related to them: administrative information, insurance, fuel or care expenses..."
Living on a tight budget is tough. Everything is affected by it, particularly the care and maintenance of your cars as well as gas expenditures. You can't afford to let your car care go as this may set you up for a costly repair, and you should monitor your gas purchases to help you decide whether or not your current car is cost effective. Cars iManager helps you take care of all these tedious book-keeping functions, and can be used to monitor both cars and motorcycles. This app lets you store everything related to your vehicles such as insurance, fuel or care expenses, mileage of the next maintenance, technical inspections, as well as the information related to your favorite service providers such as garages, custom shops or stores and assistance providers. - Calculate a carbon footprint depending on the consumption of the vehicle, as well as the mass of carbon dioxide (CO2) it produces (total and average by day or mileage). - Manage a directory containing all the information of the service providers for your vehicles: insurance companies, garages, shops, clubs, associations, etc. You can then easily locate them thanks to the Maps interface. - Geolocate your current position or your parking spot in a single click, so you can easily go back there later with the integrated GPS visual guiding function (or with Maps directions). - The tools section can also help you find various services around your location: gas stations, garages, restaurants, hotels and others. - Stay tuned to car news: it comes with a number of RSS feeds allowing you to be informed of anything related to cars and motorsports. - Automatically adapts itself to the units of measurement effective in your country: kilometers or miles for distances, liters or gallons for fuel. The thorough nature of this app leaves no loopholes as far as monitoring and recording all critical information related to your vehicles. The many functions allow you to build over time a nice picture of the performance of your car as well as its cost in all areas to you. COOL CONCLUSION: "Keep tabs on your vehicles with Cars iManager's useful, informational records notation fields which allow you to maintain your car without forgetting one detail!" 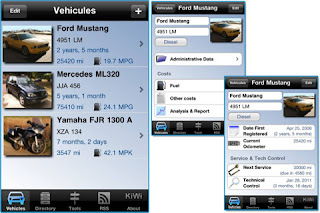 --Tip/Tutorials: Cars iManager Lite is also available on the App Store for free.